The most balanced coverage of the writing process, grammar, research, and other issues important to today’s readers. 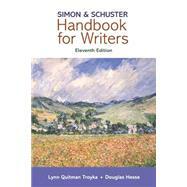 The Eleventh Edition of the Simon & Schuster Handbook for Writers , from trusted authors Lynn Troyka and Doug Hesse, continues its emphasis on critical thinking and reading as fundamental skills, integral to quality writing and sound research practices. This handbook provides all the information that readers need – how to write papers, use and document sources, write online, write with visuals, master grammar, and use correct punctuation. Designed for easy use and speedy entry into all topics, this book welcomes readers into a conversation about becoming better writers, and makes them feel supported every step of the way. 1. Be specific: use RENNS. 3. Check Part 2, “Frames for College Writing,” for ideas. 4. Focus on purpose and audience. 5. Use logical, ethical, and emotional appeals. 8. Develop your ability as a critical reader and thinker. L When to use etc.